Betty Sue Anthony, 83, of London, passed away, Saturday, May 12, 2018 at her home in London, AR. The daughter of Joe and Grace Pitman White, she was born April 14, 1935 in London, AR. She was a graduate of Lamar High School Class of 1952. She married Aaron Anthony, on November 28, 1954 at London, Arkansas. She was an employee working in the textile industry as well as Con Agra Foods of Russellville. 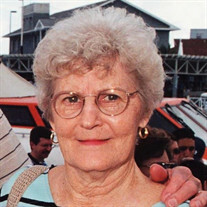 Betty was a devoted wife; loving mother; grandmother and great grandmother. She was a member of the Extention of Homemakers. She was a member of the Knoxville First Baptist Church. She enjoyed sewing, cooking and spending time with family. She was preceded in death by her parents; a great grandson, Camden Puls; a brother, Gaines White. Betty is survived by her husband, Aaron Anthony; three daughters, Connie Puls (Kevin), St. Clair, MO; Jo Young, London; Jackie Hay (Jeff), Sikeston, MO; eight grandchildren, Erin Havrilka (Josh); Ryan Puls (Brittney); Nathan Puls (Tabatha); Rebecca Young; Zachary Young; Jeffrey Hay; Kathryn Hay; Elizabeth Hay; 16 great grandchildren; three brothers, Don White; Jerrell White (Esther); Roger White (Mary) and a sister-in-Law, Shirlene White. Funeral Service will be held at 10:00AM, Thursday, May 17, 2018 at Humphrey Chapel. Bro. Richard Snyder will officiate. Burial will be at Mt. Carmel Cemetery in London by Humphrey Funeral Service. Visitation will be from 5:00 pm to 7:00 pm, on Wednesday, at the funeral home. Memorials may be made To Arkansas Hospice River Valley Home,220 John Babish Lane, Russellville, AR 72801 or Mt. Carmel Presbyterian Church Building Fund 1470 Mt. Carmel Road, London, Arkansas 72847 .